Theodore Schulz, Shaw, and Evelyn Herzog at the Notre Dame Workshop (South Bend, IN) 1977. Image courtesy of Steven Doyle, who was present at this first Shaw Workshop. The first John Bennett Shaw Sherlockian Workshop, John Shaw, front and left. Image by S. Doyle. John Shaw conducted his first Sherlock Holmes workshop at the University of Notre Dame in 1977. Although the first one was a full five-day event, subsequent workshops evolved into weekend events with John as the main presenter, invited guest presenters (most often, noted Sherlockian scholars), film clips, books discussions, sing-alongs, and one or more of Shaw’s “diabolical” quizzes. And there were meals and a fair amount of imbibing on the part of everyone. Steven Doyle (BSI). Image from Dan Andriacco’s Baker Street Beat. Click image to visit Dan’s blog. and publisher of The Baker Street Journal, made his start in Sherlockian publishing with his critically acclaimed periodical, The Sherlock Holmes Review (1987). He is also the mastermind behind the five Gillette to Brett conferences, held at the University of Indiana in Bloomington. Doyle had this remembrance of his experiences at the 1977 Notre Dame Sherlock Holmes workshop. 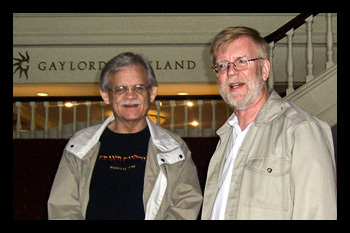 Jim Hawkins with Chris Redmond in Nashville, TN at the Opryland Hotel (2008). The Notre Dame Workshop continues to be the model for most of the Sherlockian conferences today. Steven Doyle admits that all his conferences are built on this model, his very first Shaw/Sherlock Workshop. The only difference is that this was the only five-day event. Most workshops nowadays are weekends only. Presenters in that first symposium included Notre Dame faculty members Michael Crowe and Fred Crosson, as well as other professors with Sherlockian backgrounds, notably, Ely Liebow from the Northern Illinois University and Frank Hoffman from the State University College of Buffalo, NY. John’s BSI friend Michael Whelan (BSI - 1974) led a session on the London of Sherlock Holmes. It would be almost a year before the next Shaw Sherlock Weekend would be held. John adjusted the schedule and set the program for all those to follow. Let’s step back a bit to the time before the first workshop. 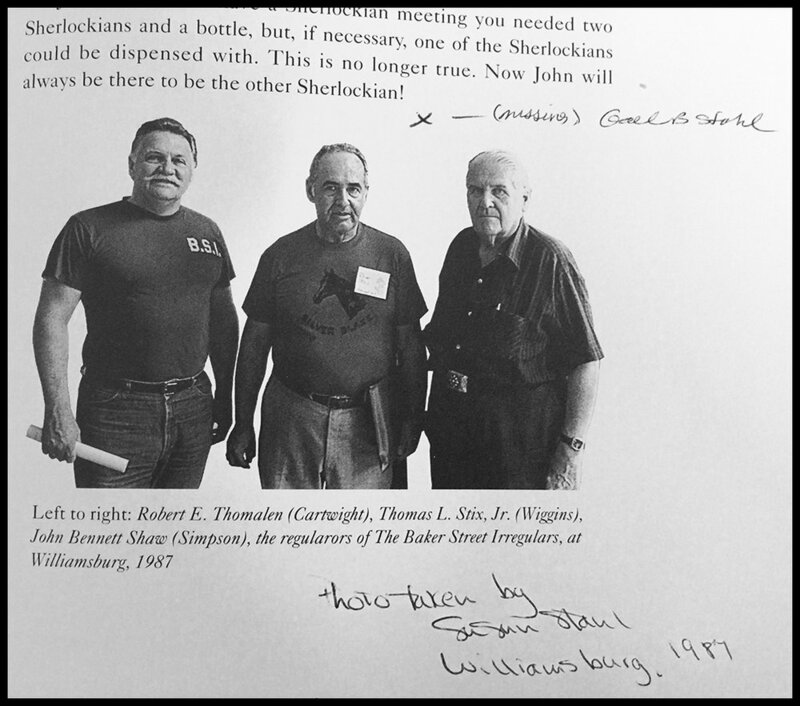 Where did John Shaw come up with the idea of doing Sherlock Holmes workshops across America and abroad anyway? Jon Lellenberg offers this insight. (But) an event which helped convince Shaw of the possibilities of such a program, drawing people from afar, was a Great Alkali Plainsmen dinner a year earlier to which he came, now that the scion society to which he'd belonged in the 1960s was restored to life and hitting its stride. It attracted people from four other scion societies as well, the closest of them 200 miles away. See the attached section of my Plainsmen history. That very lively dinner was quite an evening, more so than any of us had expected; it got Shaw thinking, and his first workshop a year later was a result. Scanned program for the Great Alkali Plainsmen meeting August 21, 1976. Planning was already underway for a major extravaganza on what turned out to be the blazing hot day of August 21st (1976). John Bennett Shaw was coming up the Santa Fe Trail to his old scion for the first time since 1968, and both he and Lellenberg talked the meeting up a great deal to neighboring scion societies on the edge of the Plain. John Ferrier would have been impressed by the fair crowd that came. Besides fifteen Plainsmen and Shaw’s separate entourage of eight, the meeting was enlivened by three Afghanistan Perceivers, two Arkansas Valley Investors, four Maiwand Jezails, no less than ten Noble Bachelors of St. Louis, plus two wide-eyed NBC TV people from New York. In Kansas City to cover the just-concluded Republican National Convention, they had taken in the spectacle of the Irregular mob at cocktails – Shaw had insisted on a ninety-minute cocktail “hour” – and asked if they might join the bacchanalia for the meeting. Shaw has always been a good drawing attraction, and this was no exception. Lellenberg was in the Chair, Shaw reigned as conquering hero returned, and a more lively Plainsmen dinner has seldom been seen. Traditional toasts by Milt Perry, Bill Wright, and Richard Miller of The Brothers Three of Moriarty were followed spontaneously by the additional toasts from the floor. There was indignant Shavian spluttering when the guest of honor discovered that Lellenberg had thoughtfully arranged for him to drink the toasts in his traditional Plainsman grape juice. The Workshop is an opportunity to explore a fascinating subject in a way that combines insight and imagination with an abundance of good humor and fun. It is also an opportunity to meet and exchange ideas with men and women from around the country who share an interest in Holmes. Plan now to participate in what promises to be an excellent program. at the Duquesne Workshop that set Ray Betzner on his way to a life with Sherlock Holmes. Titled A Sherlockian Weekend, this event was sponsored by The Pennsylvania Small Arms Company. Just as the Notre Dame workshop encouraged a young Steven Doyle to become a major player in Sherlockian publishing and programming, the event in Pittsburgh set another youngster on his way to Sherlockian stardom: Ray Betzner (BSI - 1987), assistant vice president, University Communications, Temple University (Philadelphia, PA). The photo at the top of this section is a young Betzner with John Shaw at Ray’s first Sherlock Holmes Weekend, the one highlighted by the brochure to the left. Just seven years later, when Betzner was employed by the College of William & Mary in Williamsburg, VA, he organized a Sherlock Holmes Workshop featuring John Shaw and Michael Harrison as headliners. In his spare time Betzner authors the Vincent Starrett blog. Pictured above (click on arrows to access images): The Program (images 1 and 2), and (3) Evelyn Herzog at the lectern with Shaw seated. We come now to the 1987 Williamsburg, VA, workshop at the College of William & Mary. Ray Betzner was the organizer, and here is a bit of background from him about the event. “This deserves a little explanation. I had attended a few Shaw workshops (Duquesne, Stevens Technical Institute, one in Georgia) and really wanted to host a Holmes conference in Williamsburg. I was shifting careers at the time, leaving the Daily Press and starting to work in PR at the College of William and Mary. W&M had a small summer conference program, and we (Chuck and Peggy Henry, John Lanzalotti and I) put together a pitch to Shaw. This is the letter where he agreed to do it (below). You can see he wanted to it to be a hit, and it was. We budgeted for 100 and had to stop registration at 200 because we didn’t have space for everyone. It was exhausting and wonderful and one of the great adventures of my life. Seven Nashville Scholars, including Jim Hawkins (attending his one and only Shaw workshop), made the drive from Nashville to Williamsburg. Gael Stahl was president of the Scholars at that time, and he brought with him a proclamation from Governor Ned McWhorter of Tennessee, “that people of Tennessee commemorate the one hundredth anniversary of Sherlock Holmes’ first appearance in print.” Stahl arranged for a group photo to be taken with the BSI leaders in attendance: Bob Tomalen, Tom Stix Jr, and John Shaw. As president of our scion Gael decided to be in the picture (these days we call it photobombing!). Almost 10 years later, in 1995, The Detective and the Collector: Essays on the John Bennett Shaw Library was published on the occasion of the dedication of that library. As I turned the pages of the book, remembering the good times with John and Dorothy Shaw at their Santa Fe home, I came to this photo, but without the hand-written notes, added later by Gael and Susan Stahl. Our Nashville Scholars have laughed about the “missing Stahl” often. Here is a report on the William & Mary workshop, written by Gael Stahl, for the Nashville Tennessean. Many significant events were held in 1987, the centenary of the first appearance of Sherlock Holmes in A Study in Scarlet. It was such a joy to be able to attend the Shaw Weekend at Williamsburg, even though I had to sell the 20-gauge shotgun I had inherited from my father to have enough money for the trip. This was prior to my first visit to the Shaws’ home in Santa Fe, in the summer of 1988. Ray Betzner had everything organized. Michael Harrison did indeed headline the event, along with Shaw. And, was it hot! Betzner remembers Mr. Harrison being dressed in a wool suit for the entire event. Santa Fe Community College was only in it’s 10 year when Shaw held his last Sherlockian Workshop here in 1993. Brad Keefauver, along with his wife Kathy Carter and friend Greg Ewen, attended the 1993 Shaw Sherlock Holmes Workshop at Santa Fe Community College. It proved to be the last workshop that John Bennett Shaw was to lead. Brad was elated at the friends he made there and wrote about it enthusiastically in the September 1993 issue of the Hansoms of John Clayton newsletter Plugs & Dottles.